It’s easy to become desensitized to the never-ending procession of data hacks in news headlines, but once someone starts stealing your identity or taking control of your social media accounts, you’ll probably give it your full attention. If you ever want to find out if one of your accounts has been compromised, there are some simple-to-use tools that can help. First and foremost, Have I Been Pwned? does a very good job of monitoring data dumps and hacking stories and working out who’s in trouble. Just enter your email address or username and the site will check its records of more than a billion accounts. You can also have the site notify you if one of your accounts becomes exposed. The site takes data from publicly leaked breaches that’s been illegally obtained and then posted on the web, making the whole lot easily searchable. It covers recent hacks of LinkedIn, MySpace, Tumblr, Dropbox and more. 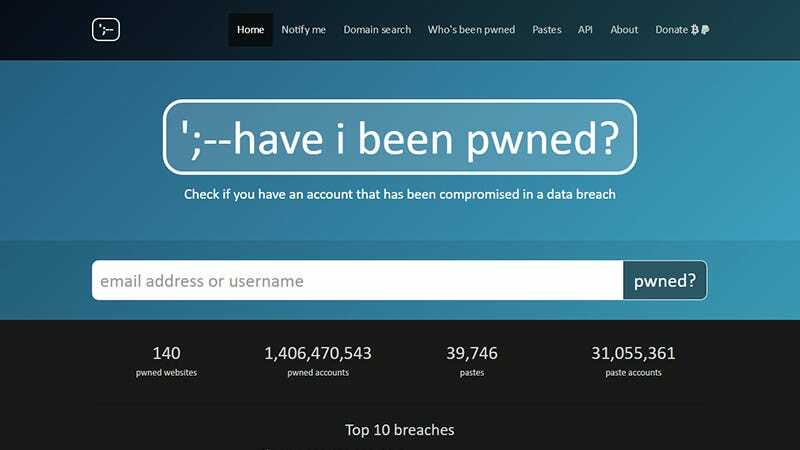 If you find that you have indeed been “pwned,” check the relevant account for suspicious activity and change your password at the earliest opportunity. It’s a good idea to turn on two-step verification as well, if you haven’t already done so. Remember hackers might try your email address and password combination on other sites and services too, one of many reasons why you shouldn’t use the same password for everything. There are various other similar sites out there, but Have I Been Pwned? is just about the best and the most transparent, and it’s free to use as well (unlike some of its rivals). It’s worth spending a few minutes to run your credentials through the site to see if you’ve got anything to worry about. It might just give you the chance to change the virtual locks before any unwelcome visitors arrive.